trength t﻿﻿raining to failure isn't always a Force for good. You see examples of it everyday ﻿﻿﻿﻿﻿﻿in your gym. Picture, if you will, a crimson-faced ﻿﻿trainee gasping like Darth Vader with a ﻿﻿﻿chest cold as they desperately grind out a final do-or-die death rep. Pretty it ain't. But what if there was a more effective way to monitor your training intensity and adapt your workouts to your current strength levels? 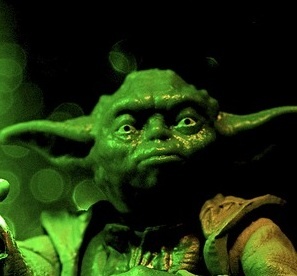 ﻿What if you could let your body's inbuilt wisdom guide you like your very ﻿﻿own personal Yoda? You can, young Jedi, and it is easier than you might think. In the same way Star Wars' Master Yoda uses the Force as a powerful ally, you can use your body in the same way. How? By learning to listen to it. Indeed, the simple act of listening not only helps you avoid the jeopardy of over-training, but gives you Jedi mastery over your workouts. ﻿﻿There really is no value in trashing yourself each strength session and destroying yourself. Training to failure and fatigue only works so far, but soon it takes a lot out of you as you battle against the weights. It is the Dark Side, young Skywalker, and help you it will not. Instead, relax like Yoda and conserve your "nerve force". What does that mean? Everyone has good training days and bad training days. Some days lifting weights makes you feel like Darth Vader with his chest cold, and other days you hit a sweet spot and everything is easy. Because of this variance, training to this sweet spot is done by feel. Exercising in this manner is the principle of auto-regulation. You don't decide in advance how much weight to push or how many reps to do. Instead you gauge how far to drive yourself based on performance and how you feel. And how do you do that? RPE. Rating of perceived exertion (RPE) is commonly used in cardio workouts but can just as easily be applied to strength training. This is where you need to "feel" your way to know how far you should be pushing yourself. How do you do that? The best way is to monitor repetition speed. For example, the moment your reps begin to slow and no longer resemble your earlier efforts, you stop. If you have been listening to your body you should have one more rep left inside you - this training effort represents an RPE of 9. Feeling the Force and listening to your body is an effective way to monitor your training intensity and adapt your workouts to your current strength levels. In the same way Star Wars' Master Yoda uses the Force as a powerful ally, you can use your body's inbuilt wisdom to guide you too.